When I finished The Jewel I needed to move on to The White Rose, because I thought the novel was interesting and wanted more. But after reading the synopsis on The White Rose I felt less interested and disappointed. Now that I have read it, I still feel disappointed. 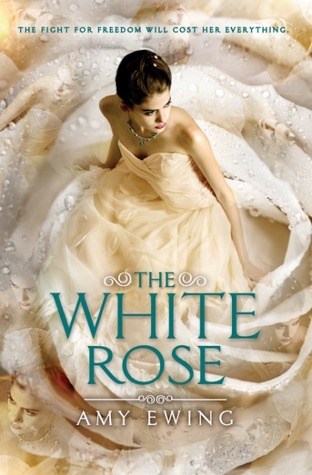 I give The White Rose by Amy Ewing three out of five hearts. I didn’t love it, almost even didn’t like it. It was disappointing compared to The Jewel and not interesting. I gave it three hearts, but I think it is more like 2,5 hearts. The story of The White Rose is slow and takes forever to get anywhere. Violet and Ash run and saving Violet’s friend, Raven, in one fell swoop. Everything the reader knows about the Auguries becomes a lie and get drenched in a cold bath. And Violet can’t trust anyone. The action Amy put in is a sad resonance of the events of The Jewel. Ash’s background is lightly tipped on again and it kept me wanting more information on him. I still want to know everything about him, but I almost feel I rather read a novel on Ash than on Violet. Overall I am not happy with this series. Unless I can get my hands on The Black Key soon, I do not think I will ever pick it up again. This entry was posted in Book Review and tagged Adventure, Amy Ewing, Book Review, Fantasy, Romance. Bookmark the permalink.